When I began working at Satya, I needed a job. I did not know what I was getting into; I hadn’t considered myself an activist and, looking back, I was embarrassingly unfamiliar with the issues the magazine covered. I was basically somersaulted into realities I had not known existed. And an integral part of my awareness was that these issues, despite being new to me, had always existed. People and animals and trees endure suffering whether the public recognizes it or not. The suffering of others is not alleviated when no one knows about it. Over time, working at Satya became more than a job. It captivated me. I would happily take work home, working on or editing articles in lieu of subway reading. The material was important to me, and it seemed best shared with others, which, conveniently, was my job—to learn and to share. I had it good. What made it even better was that my workplace was more than an office. It had become a second home, and the people I shared it with family. For four years I was part of a team that worked not only to raise awareness of problems facing our world and the people acting to mitigate them, but also, and perhaps more importantly, to draw connections between them all. I can never quantify or put a value on how much I learned while at Satya, but the most valuable things I took away were an understanding of the need to search for the broader context behind everything we see and hear, and the ability to keep my mind open. I don’t know if this was more because of the countless times when I thought things couldn’t get any worse—and they did—and I would start to wonder why we were bothering to try to do good when there was so much bad. Just then, I would meet or learn about someone doing the most incredible things. I was continually surprised when I thought I was too exhausted to be. The exhaustion came, of course, from sitting and learning without acting, and I began thinking about, researching, what I might do if I left, and I did. I went to Kenya. My plane ride was filled with an incredibly promising and confident optimism I can’t recall feeling at any other point in my life. I was going to work with someone I’d long admired for her work planting trees and for motivating, encouraging and inspiring countless others to do the same. I arrived to find that, up close, the organization was run with its problems and inefficiencies just like any other. It wasn’t the eco-fairytale I’d thought; and I found myself at times wishing I hadn’t come. After eight months in Kenya, I found myself working with a community development project on Rusinga Island, in a much more rural region of the country. The site has a health clinic, a water treatment and sanitation education program, a reforestation project, income-generating activities designed to promote self-sufficiency and a computer center—the first to bring computer skills and internet access to the island. The final element was the nursery school, largely for children orphaned to the community’s rampant AIDS epidemic, which, at 44 percent, ranks among the highest in the country. It seemed like the embodiment of all the reasons I loved Satya—the integration and interlacing of seemingly separate issues. There was emphasis on saving trees and on the needs and rights of people, and how the two overlap—understanding that you can’t fundamentally improve one without, intentionally or not, advancing the other. The beauty of the project was it helped people defeat poverty by creating self-sufficiency and environmentally sustainable livelihoods. The project seemed like a way to bring the words of Satya to life…or at least, to my life. Plus, I was living in a hut in a small village—something I’d always dreamed of doing. My time in Kenya brought countless laughs and profound joy, all rooted in appreciation for my new surroundings, the giving heart that lived in almost everyone I met, the sense of family that I felt even though my own was so far from my reach. I was living in an area like the ones I’d read about in a thousand reports published about poverty—or “extreme poverty,” since that’s a distinction researchers find worth making. Yet, in addition to the hardships, I felt the ability of people to smile despite their difficulties, and the sense of community, a safety net created by people joined together, through which they do their best not to let anyone fall. It is an atmosphere that I had no basis from home with which to compare it. Perhaps this difference exists because of the hardships; perhaps they have instilled in people a respect and appreciation for life. They are lacking many comforts that people in other parts of the world, and of the country, are lucky to have access to; people with the fortunate ability to always want, and get, more and better things. Perhaps it is that ability that brings less happiness to many of those people. When tomorrow is more promising, you can’t wait until it comes. The hurdles that life on Rusinga throws at its people are not minor; too many mothers lose multiple children because they can only afford to seek medical treatment when it’s an absolute emergency; but by then it’s often too late. Last summer, a woman I knew brought her son to the hospital for malaria treatment, but he died in her lap on the bus ride there. The loss of a child, a family member, is not easier or harder for people in one region of the world to face versus in another. It is not a lack of caring that allows children to die. It is a lack of the means that would allow them to not. People grieve, funerals are held and attended by the community at large. In the local culture, mourning is expressed with a loud wailing, and in a region with a rather short life expectancy, such cries are often heard throughout the village on a daily basis. And then they return to their everyday lives; they do not have the financial comfort to be able to abandon their means of generating income. As people get back to work and continue to grieve, the smiles eventually creep back. Like most places, people dream of a better, easier life. But I observed a sharp distinction between want and need, and people are able to blend their dreams into, and still enjoy, their daily lives. My time in Kenya was an uplifting experience, and my return home difficult. Once the excitement of the happy reunions faded into normalcy, a deeply rooted disenchantment with the world began to invade my own. It’s nothing new, really; I have long been discontented with how our society functions and is motivated. I am still alienated by many of the values that seem rampant or lacking. Even more disconcerting, I am living in it and indeed enjoying the luxuries provided by it. There is a word in much of sub-Saharan Africa for white person: mzungu. I heard it more times than I care to remember; people get excited at seeing something new in a village and I was the other in a sea of sameness. But while I stood out on the surface, after getting to know me people often said I was “not like other mzungus.” Smiling—“you are an African.” Now, back home, I cherish being able to walk down the street without automatically drawing attention. But I often feel like I don’t belong; I don’t understand the direction in which the world is being driven, or the people around me who are driving it. I feel like the mzungu in a sea of others. There are many precious exceptions, of course. That this is Satya’s last issue has brought me more than a few tears. Since becoming involved with it, Satya has been a refuge for me in a world doing less than its best to live up to the values most people would claim for it. It’s hard for me to assess, how much of my sadness is for Satya, and how much is for the void in the world that it has worked for so long to fill. The void might seem even bigger now, because we’ll know what’s missing. But if we can take from it the larger lesson of drawing connections between the threats facing our world, and establishing and fostering connections between people who understand and want to fight them, perhaps the void can be made less vast. 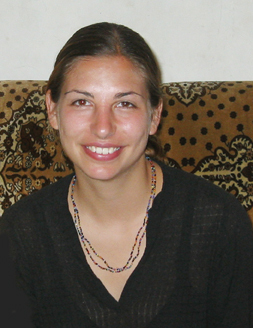 Rachel Cernansky is a consulting editor and the former assistant editor of Satya. She will be pursing a master’s degree in journalism at Columbia University in the fall.